Red Onion and Okra Fritters are a lighter savoury snack suitable for shorter rides or just to get you to the coffee shop. Okra is not a well-known vegetable in Australia. It is a seeded pod eaten while still green and tender, and the seeds provide a delicious nutty flavour. In subtropical climates you can grow it year-round. One aspect of okra that not everyone appreciates is the sticky character of the flesh. However, in these fritters all of the juices absorb into the dough, so that aspect is not apparent in the final product. While okra is used in different cooking styles around the world, this recipe gives a nod to its place in Southern cuisine by pairing it with blue cornmeal as well as red onions. You can buy blue cornmeal here, or in a pinch, you can put yellow polenta through a coffee grinder to get a finer texture. You can also make a gluten free version of this recipe by replacing plain flour with a commercial gluten free mix or with brown rice flour. Finely chop okra and red onion, then mix chopped vegetables, egg and salt in a bowl and stir to coat. Mix flour, blue cornmeal and baking powder in a separate bowl, then stir through the egg mix. The batter will be fairly dry, so if necessary, you can add water a teaspoon at a time to thin it out slightly. Fry spoonfuls of batter over medium heat with a little extra virgin olive oil until well browned on both sides. Makes around 8. 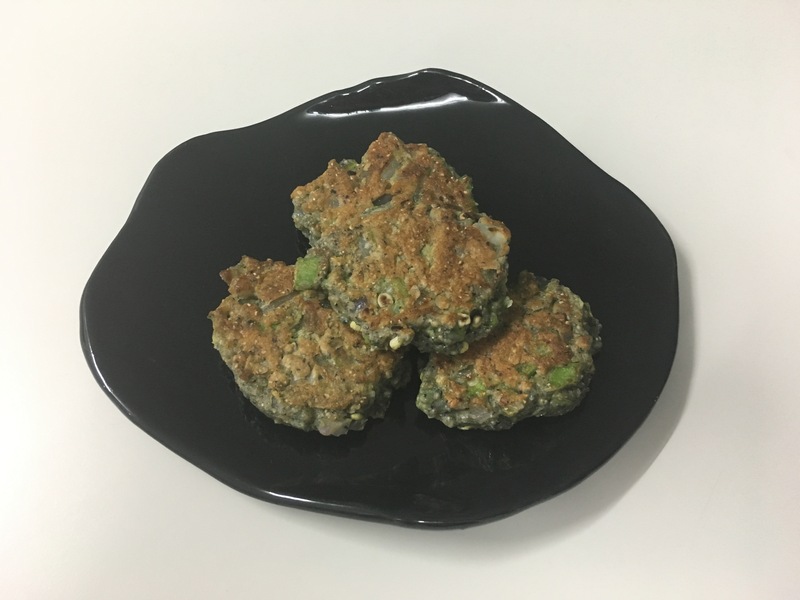 Fritters will keep well in the fridge for a couple of days and make a good daytime snack.